The Oscar Mayer Wienermobile has been a promotional tool for the Oscar Mayer Company for years. They have several of these vehicles that travel throughout the country doing promotional events. I would be willing to bet the farm that ALL the Weinermobiles carry full auto insurance as well as business liability insurance. 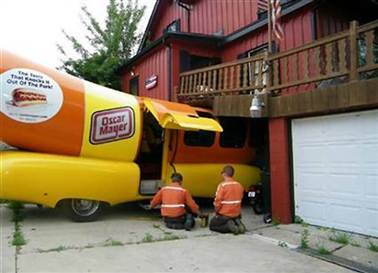 Even a state of the art Wienermobile can have mishaps as you can see from the picture. This little mishap occurred back in July of 2009 when the operator of the Wienermobile hit the gas when she thought she was in reverse and slammed into this house in Racine, Wisconsin. Luckily, nobody was hurt and an Oscar Mayer spokesperson said insurance would cover all the damage. Oscar Mayer is a big company, but most hot dog vendors are small businesses. Sometimes, the small business person can have a tough time getting business liability insurance. That's why it pays to work with an insurance agent that specializes in small business general liability products. The folks at Bolt Insurance Agency aren't just small business experts either- they specialize in business liability insurance policies for hot dog businesses and mobile vendors of all kinds. If you ever have a mishap in your own "wienermobile," you will want to be sure you have full business liability insurance to protect you and anyone who may be accidentally harmed during the course of your day. Nobody plans for mishaps, but when they occur, it is better to be safe than sorry! The folks at Bolt Insurance Agency will take good care of you and give you a free, no obligation quote on business liability insurance for your hot dog business. It used to be finding liability insurance for a hot dog cart was a difficult task-it certainly was when I got started. Now many major insurance carriers provide liability insurance for mobile businesses of all kinds. Like anything else, it pays to compare. That's why working with an agent who specializes in small business insurance for mobile vendors is such a good idea. They'll save you time finding and comparing different business liability insurance policies for your hot dog cart, taco truck or any mobile food business. I have partnered with Bolt Insurance Agency Online , a national insurance agency that specializes in small business and can provide mobile food operators the best choice for their liability insurance needs. There are many liability insurance carriers for hot dog carts and Bolt will find the insurance coverage that best suits your particular state. They work with all the major small business insurance companies, so they will find you the best insurance provider. The folks at Bolt will also get you the best possible deal on your hot dog cart insurance too. They are the specialists when it comes to small business liability insurance of all kinds. If you'd like a quote, simply click on the insurance quote form below or click here for Hot Dog Cart Insurance Quotes - Compare quotes online from multiple insurance companies for your mobile food business- FAST!